Business meetings encourage pro-activity and productivity – if conducted in the right way. Discussing projects in a group setting can allow for creativity to flow and to help motivate team members. They also provide an opportunity for managers to check that all work is on track. Make sure that every business meeting is productive and follow these steps for a successful business meeting. Ensure that everyone is prepared for the meeting by sending out an agenda of what will be discussed in advance. This gives all attendees the opportunity to complete any prep work required. If everyone attends with the materials needed for the discussion, the meeting is likely to be more productive. In the meeting, be sure to stick to the set agenda to discourage the meeting going of topic. If members start to get distracted, try to stir the conversation back as soon as possible to make sure that time isn’t wasted. Top tip: Use glass partitions to create your meeting space. The glass walls will remove any feelings of claustrophobia that long meetings can create. They will also make employees feel less ‘trapped’ in long meetings that go over the set time. Regardless of whether all attendees arrive on-time, start the meeting. This will reduce the likelihood of those participants turning up late again. Also, it will be less likely that the meeting will run-over if it starts on-time. Having a start and end time, and making a point of these being adhered to, will encourage attendees to be present and take an active role, ensuring it’s as productive as possible. Top tip: Glass partitions provide transparency, which provide a feeling of inclusiveness. This can be in two respects; glass office partitions will provide openness in the office, and attendees will be less likely to slack and check their phone as people will see. The less meetings that are held, the more important it is that the meeting is productive. If too many meetings are held, they may start to feel redundant. Review whether a meeting is necessary, or if a phone call or on-to-one conversation would be sufficient. If meeting numbers are reduced, this will encourage team members to improve the quality of the meeting so it’s as beneficial as possible. Whilst in the meeting, everyone is in the moment and there’s a feeling on confidence that everything being discussed will be implemented. After the meeting, each team member goes back to their daily tasks and it quickly happens that the day flies by and discussions from 9am can be hazy by 4:15pm. One of the best ways to make sure that a business meeting is successful is for the actions discussed to be rolled out. Allocate someone to make meeting notes, and to type these up and send them to all attendees. This ensures that everyone knows what they’ve been tasked to complete and what the discussed steps are for the project. A great way to establish how productive business meetings are is to discuss what the attendees thought of the meeting. Was the structure right; did they feel it was productive? Was it too long, or not concise enough? If you meet with the same team often, this step is particularly important as discovering what works best for all members and implementing this will push you in the right direction towards a productive meeting. 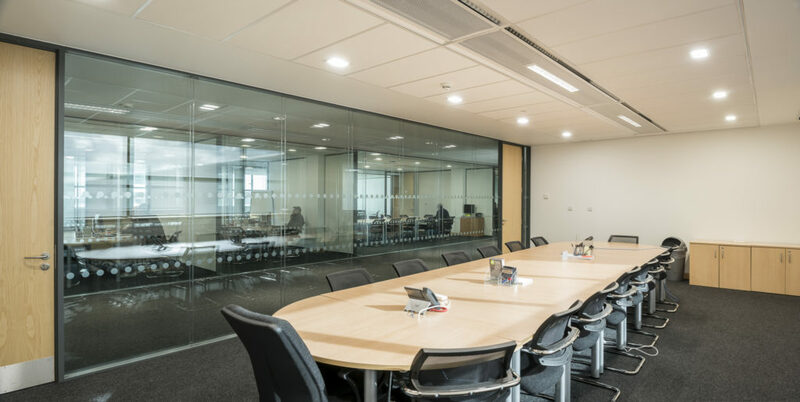 To discuss your meeting room design ideas and to find out more about how Applied Workplace can help you with glass partitions, get in touch with our friendly team on 01202 577 776. For a price for office partitions, use our free quote calculator.